This is the famous Nordy Bar recipe served at the Nordstrom Cafe back in the 80’s. The bars are a rich mix of chocolate, butterscotch, marshmallow and nuts. Simple and so delicious! Many moons ago, when we were living in Portland, and Grant was going to law school, I worked at PacifiCorp. We often had “Food Fridays” where everyone would bring treats and recipes to swap. 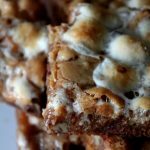 My good friend and co worker Jane loved to eat and cook and shared this wonderful recipe for Nordy Bars from the Nordstrom Cafe with me! The story behind the recipe- Relatives of Jane’s were in a Nordstrom Cafe in Portland one day, and bought a cookie bar. They loved it so much, they asked for the recipe. The girl serving them went into the kitchen, and a few minutes later came out with the recipe and made them promise not to tell anyone. The Nordy Bar is a yummy, chewy, butterscotchy, marshmallowy, chocolaty slice of heaven. If you don’t love these, well, let’s just say, I’m not sure we can be friends. In large saucepan, melt butter. Add butterscotch chips and brown sugar. Stir until all melted. Do not boil. Remove pan from heat and let cool for about 1/2 hour. Stir in rest of ingredients just until all ingredients are incorporated. Spread mixture into a 9x13 greased pan. Bake at 350 degrees for about 20-30 minutes, or until knife inserted in center comes out without batter attached. - I like to line the pan with parchment paper.-The original recipe has a 15-20 minute baking time, but the bars were never cooked enough. I usually bake for about 25 minutes.-These bars are best when cooled and cut into small pieces and refrigerated. Yep, we’re friends. I have never honestly considered asking for a recipe. Haven’t you ever watched “Dateline” where you see what the restaurant workers can do to (or at)your food?? These looketh yummy. My comment is : HAHAHAHAHA– Ann’s blog picture. oh! Gma vh is Ann! Yeah! The pic is too small and I was wondering who in the heck she was!! I’ve got to try these! Oh, Yummy! This is Angel Murdock (Jake’s wife). JoAnne turned me on to your blog. Good thing! I’ve already found about 4 recipes I want to try!!! Keep it up! Angel- let me know what you try…thanks for the comment! 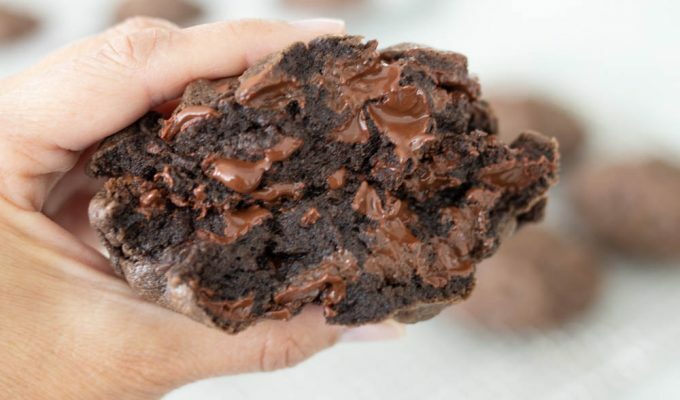 I just made these and they certainly are yummy!!!! My oven is dying a slow death so I had to cook them for about 35 minutes. You need to read my latest blog post! Oh Si, you’re so kind to still tolerate me even after I don’t appreciate the nuances of good cooking. I’m sure you were thinking of me with your “super-under-achiever” comment, too. I know I was! I repeatedly disappoint you and Becky both with my lack of fervor for the culinary world. I just threw an immature “I HATE cooking!! !” fit at 6pm yesterday when I had once again managed to avoid any thought of dinner preparation the entire day. It was great until everyone started announcing their hunger to me like it’s my job to feed them or something! Doh! Busted again! These were a huge hit at our superbowl party. Very good! I made these this morning and just ate two now! So good. Used your parchment paper idea. Also, only had about a cup of marshmallows but they still turned out so well. Baked for 28 min and that was perfect for my oven. Thank you for another great recipe!